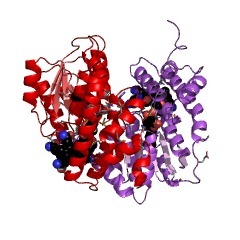 Cobalamin-dependent methionine synthase is a large modular protein that catalyses methyl transfer from methyltetrahydrofolate (CH3-H4folate) to homocysteine. During the catalytic cycle, it supports three distinct methyl transfer reactions, each involving the cobalamin (vitamin B12) cofactor and a substrate bound to its own functional unit (PUBMED:11731805). The cobalamin cofactor plays an essential role in this reaction, accepting the methyl group from CH3-H4folate to form methylcob(III)alamin, and in turn donating the methyl group to homocysteine to generate methionine and cob(I)alamin. 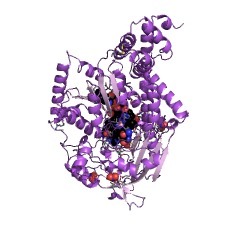 Methionine synthase is a large enzyme composed of four structurally and functionally distinct modules: the first two modules bind homocysteine and CH3-H4folate, the third module binds the cobalamin cofactor and the C-terminal module binds S-adenosylmethionine. 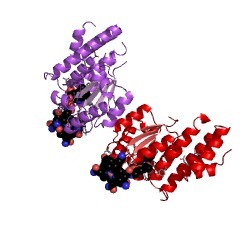 The cobalamin-binding module is composed of two structurally distinct domains: a 4-helical bundle cap domain (residues 651-740 in the Escherichia coli enzyme) and an alpha/beta B12-binding domain (residues 741-896). 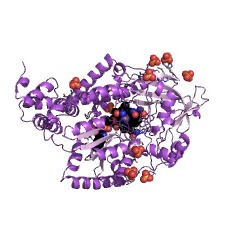 The 4-helical bundle forms a cap over the alpha/beta domain, which acts to shield the methyl ligand of cobalamin from solvent (PUBMED:8939751). 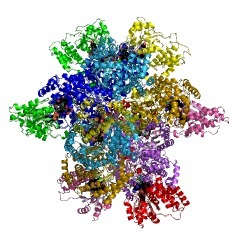 Furthermore, in the conversion to the active conformation of this enzyme, the 4-helical cap rotates to allow the cobalamin cofactor to bind the activation domain. The alpha/beta domain is a common cobalamin-binding motif, whereas the 4-helical bundle domain with its methyl cap is a distinctive feature of methionine synthases. 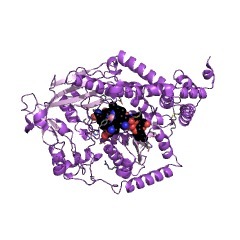 Cobalamin-dependent methionine synthase (EC 2.1.1.13) is a large modular protein that catalyses methyl transfer from methyltetrahydrofolate (CH3-H4folate) to homocysteine. During the catalytic cycle, it supports three distinct methyl transfer reactions, each involving the cobalamin (vitamin B12) cofactor and a substrate bound to its own functional unit [(PUBMED:11731805)]. The cobalamin cofactor plays an essential role in this reaction, accepting the methyl group from CH3-H4folate to form methylcob(III)alamin, and in turn donating the methyl group to homocysteine to generate methionine and cob(I)alamin. 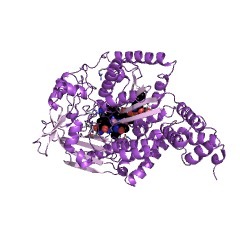 Methionine synthase is a large enzyme composed of four structurally and functionally distinct modules: the first two modules bind homocysteine and CH3-H4folate, the third module binds the cobalamin cofactor and the C-terminal module binds S-adenosylmethionine. 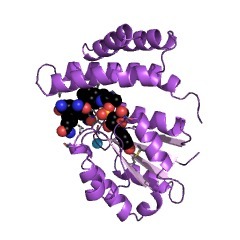 The cobalamin-binding module is composed of two structurally distinct domains: a 4-helical bundle cap domain (residues 651-740 in the Escherichia coli enzyme) and an alpha/beta B12-binding domain (residues 741-896) (IPR006158). 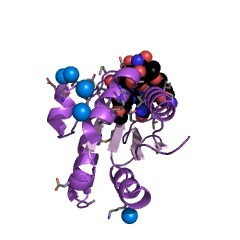 The 4-helical bundle forms a cap over the alpha/beta domain, which acts to shield the methyl ligand of cobalamin from solvent [(PUBMED:8939751)]. 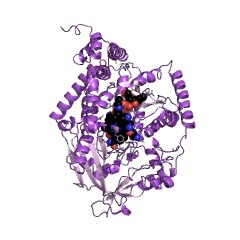 Furthermore, in the conversion to the active conformation of this enzyme, the 4-helical cap rotates to allow the cobalamin cofactor to bind the activation domain (IPR004223). The alpha/beta domain is a common cobalamin-binding motif, whereas the 4-helical bundle domain with its methyl cap is a distinctive feature of methionine synthases. This entry represents the 4-helical bundle cap domain. This domain is also present in other shorter proteins that bind to B12, and is always found N terminus to the alpha/beta B12-binding domain. There are 19821 B12-binding_2 domains in 19819 proteins in SMART's nrdb database. Taxonomic distribution of proteins containing B12-binding_2 domain. This tree includes only several representative species. The complete taxonomic breakdown of all proteins with B12-binding_2 domain is also avaliable. Click on the protein counts, or double click on taxonomic names to display all proteins containing B12-binding_2 domain in the selected taxonomic class.